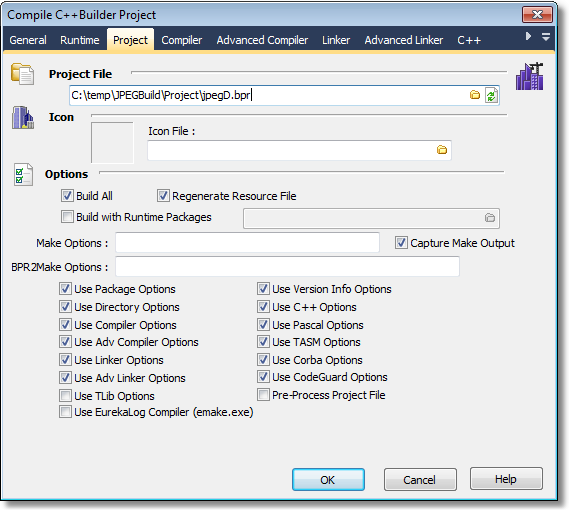 This action provides support for Embarcadero's C++ Builder versions 5 & 6. The action allows you to selectively override the settings in the project file with the settings in FinalBuilder. It provides the same interface as the Project Options dialog in BCB. Note: there are some Known Problems with this action. This action also allows you to generate Version Info for the project, and auto increment build numbers. 1) In the BCB Action's properties dialog, select a BCB 5 or 6 project. FinalBuilder will read the settings from the project file. 2) When you run the action, it will again read in the project file, and then apply the settings from the Action in FinalBuilder. You can choose which settings from FinalBuilder are used on the project tab, so for example you can chose to use the compiler & linker settings from the project file and the directories & version info settings from the action. 4) FinalBuilder saves a temporary copy of the project file, with the merged settings, then calls BPR2MAK and the Make.